This book provides additional insight into many topics of growing interest, including preoperative orthodontic therapy, dental trauma and dental implants, stress and anxiety in immediate implant placement, smoking and immediate loading, and management of complications. A final chapter on complex and unusual cases showcases the author's surgical skills and underscores her mastery of all the presented concepts. It is a book to be read and reread by the serious practitioner of implant dentistry. "This textbook covers all aspects of immediate implant placement, immediate loading, and temporization. This book takes you from the very basics to the most complex cases, including informative chapters on treatment planning, case selection, aesthetics, occlusion and the psychological aspects for the patient, to name but a few. There is something in this book for everyone and thus I would wholeheartedly recommend Ridge Presentation and Immediate Implantation to any practitioner of implant dentistry." 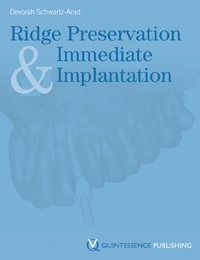 "Ridge Preservation & Immediate Implantation is a well-orchestrated presentation from an all-star group of coauthors. Each chapter is well documented, and though some chapters are independently written, they are logically placed, well coordinated, and related to the overall theme of the text. The book covers aspects of immediate implant placement following extraction, loading and temporization, with emphasis on the placement and handling of the soft and hard tissue for maximum esthetic results."